Professional presentation / promo / trailer / title sequence animation to make your media and message stand out. High quality template well structured with attention to details! Perfect to halloween, horror, triller themes. Very easy to use, well organized and optimized project. Just drop your logo/text/icon , set your colors or volume of elements and push Render. You can use this template for: halloween trailer, halloween opener, background or slideshow with mysterious photo changes effect, halloween intro, special horror opener, thriller slideshow, halloween bumper, halloween intro, halloween promo, halloween party, trick or treat, glitch horror, horror glitch, horror house, horror title, horror intro, horror transition, horror logo, horror trailer, thriller, suspense, crime thriller, psycho, thriller movie, mysterious, thriller trailer, murder slideshow. Also, you can combine this template with my other items and create: video album, summer travel or adventure in interesting tour, design your elegant reel, holiday slideshow, simple quick slideshow, showreel, demo reel or any type of slideshow, opener, promo, intro, for your media. Design your own vintage story, video for product launch, corporate presentation, product gallery, site presentation, retro style promotion, lovely opener, dynamic intro, workout instruction, documentary film. Create travel slideshow, simple slides, minimal slideshow, company history video, urban demo reel, trailer, scrolling slides, grunge media opener, sport event, present a new brand, education video, tutorial, christmas, birthday, anniversary, memorial day, wedding day, you can make any event! Create your own magazine demo reel, night party, present your portfolio, opener for any special occasions, application promo. Use it for TV show, design your awesome broadcast pack, awards package, use my work in fashion event and you can give your media more gloss and glamour. Make your own magazine demo reel, night party, present your portfolio, corporate opener, opener for any special occasions, app promo. Create video for YouTube or Vimeo or other media hosting site. You can place video in Facebook, Twitter or any other social networks and impress your friends. 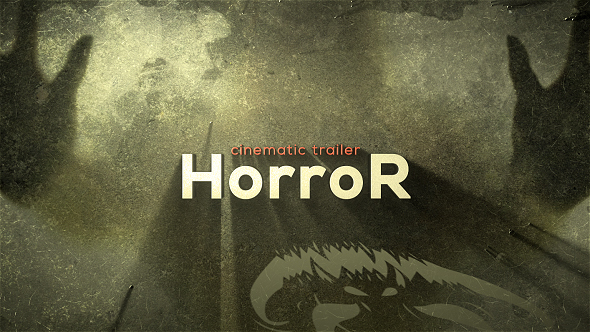 The Horror Cinematic Trailer is a high quality, well organized and easy customizing template. This project has modular structure, so you can easily change duration. Project includes description file, even if you first time run program after effects you can easily complete job. Just drop your image or video, edit the text, add audio and enjoy result!